These were the words uttered by Gabriel Batistuta to an expectant crowd of journalists following AS Roma’s 1-0 win over Fiorentina on the 26th November 2000. For many, it was simply a game of football. 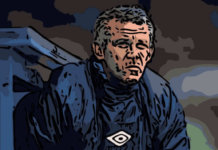 Roma were chasing the title after spending big in the summer, while Fiorentina harboured similar ambitions after a disappointing seventh-placed finish in the 1999/00 campaign. Yet for Batistuta, it was the first time Florence’s king had lined up against his former footballing queen. Sold to Roma in the summer of 2000 for a then-record £27.5m, Batigol had transferred to the capital begrudgingly; his desire to capture the Scudetto had simmered for half a decade and with the passing of his 30th birthday, that simmering desire had boiled beyond the limits of Florence. The sides came into the game in contrasting form: Roma had won five of their six opening fixtures, while Fiorentina had claimed victory just twice. Despite their differing fortunes, the contest was a close-fought affair. 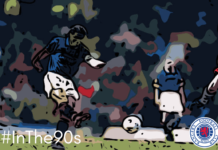 The game was heading towards a 0-0 when in the 83rd minute, a looped ball headed on by Vincenzo Montella dropped to Batistuta, lurking unmarked twenty-five yards from goal. It was a thunderbolt dispatched by the footballing gods to shatter Fiorentina hearts. Struck with such craft, Batigol swivelled a hip and lashed a right-footed half volley into the top corner past a despairing Francesco Toldo. The Stadio Olimpico erupted in a cacophony of jubilation; a resilient Fiorentina finally sundered by Rome’s newest lieutenant. 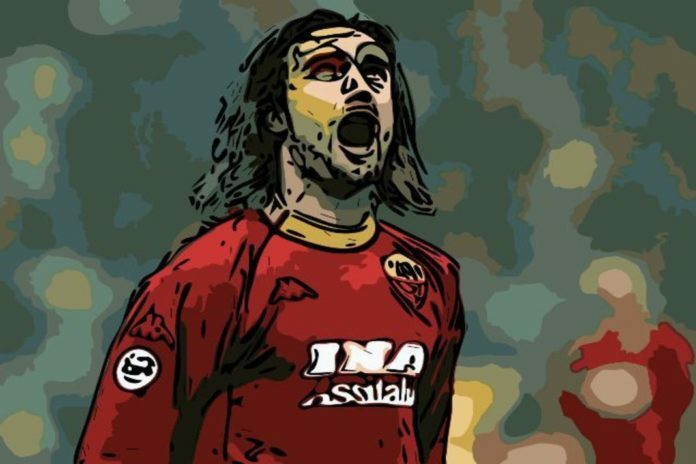 Much is made of footballers refusing to celebrate against their former employers, given the modern player’s bond to his club grows ever more fragile, but for Batistuta, scoring against Fiorentina was akin to committing treason. As jubilant Roma players mobbed him, a despondent Batistuta was tossed to and fro, dashed against the rocks of his teammates like a man at sea who long gave up all hope. It was in that heartbreaking moment that the depth and enormity of Batistuta’s bond to Fiorentina and the people and city of Florence was exposed in such stark clarity. But in spite of the sentiment, to Batistuta, football had always been a job first and foremost, and in scoring against Fiorentina, he was fulfilling the role of his profession. In similar fashion, the 2000-01 season with Roma would be functional and clinical in its manner. Despite passing the age of 30, Batistuta was as sharp as ever. Leading Roma’s ever-threatening line alongside Totti and Montella, the Argentine finisher registered 20 goals in 28 league games – a tally that would have been higher were it not for another troublesome knee complaint. As ever, his strikes were as sublime as they were significant: a fine double to sink Parma at the Ennio Tardini; an impudent near-post flick to open the scoring against Lazio and a storming hat-trick to dispatch Brescia were a few of his highlights in the capital. It seemed fitting that for a man who bedazzled Serie A for a nearly a decade uninterrupted with his inimitable forward play would score Roma’s final goal of the 2000-01 season as they clinched their first Scudetto in nearly twenty years. A 3-1 win over Parma ensured Roma finished two points clear of Juventus, and Batistuta finally had his league championship. Rome was deluged with I Giallorossi faithful much as it had been the year before in the blue of Lazio, and thrust upon the pedestal at the centre of the celebrations alongside Totti was Batistuta. He had made the difference that Fabio Capello had required in order to bring the championship back to the red-and-gold half of Rome. His clinical nature, his ability to lead a forward line with a terrifying marriage of pace, strength and endeavour, his ability to find a goal from the most obscene of angles – without Batistuta, Roma would still likely be waiting for the sequel to their championship triumph of 1983-84. Despite the ecstasy of winning the Scudetto, though, Batistuta’s time in the capital would not harvest the same joy that his time in Florence had provided. After a dream debut season, Batistuta would struggle with injuries and form, as a decade of toiling towards the ultimate goal, at last, began to take a toll on his ageing body. His ankles and knees began to falter, and with each successive injury, he found it harder and harder to regain form and start a run of games in a Roma side fast evolving without him. In his second season, having found the net only thrice before Christmas, Batistuta would go on a profitable run in January, scoring three times in three games, but it would prove something of a false dawn; his goal against Atalanta on January 27th 2002 would be his last of the campaign. The end was nigh for Batigol. The 2003-04 season dawned, and for the first time since 1991, Batistuta wasn’t assured of a place in the starting eleven. His pace had dwindled, his athleticism blighted by age and his goal return plummeted. Four goals in the first half of the season was not enough to warrant keeping him at the club and, keen to try and regain form, Batistuta was loaned to Internazionale. It was to be his swan song in Italy, but there was something inherently amiss about witnessing Batistuta don the blue-and-black of Inter. Few thought he would ever swap the purple of Fiorentina, let alone travel so far north as Milan. Two goals in twelve games signalled the end of a disappointing season, although Batigol did draw praise for his partnership with Christian Vieri. In 2004, Batistuta, now ushered out as part of the old guard while the likes of Shevchenko, Trezeguet and Andriano profited, sought a move abroad, initially to England with Fulham, but after the Cottagers turned him down, he resigned himself to departing top-level football. A move to Qatar with Al-Arabi bolstered interest in football in the Middle East, and Batistuta, now sporting short hair for the first time since his Newell’s days, enjoyed a rewarding campaign that saw him notch 25 goals and set a record for the Qatari league. It was thus that Batistuta slipped quietly from the world of football, vanishing into the cool night of Pamplona to begin his life anew in familiar, rural climes far from the intrusive world of football that had been his home for so long. With his departure, football lost one of its greats. A cult hero, for whom Fiorentina was tied inextricably to his fortunes and their fortunes to his. A love affair born not of proximity or adoration of a home-town club, but from a chance encounter when a middling Italian side took a punt on a raw, youthful footballer from Santa Fé. For many, Ronaldo is the greatest number nine in history. For others, Marco van Basten. But for anyone who grew up in the nineties and witnessed the unbridled joy of Gabriel Batistuta, there can be no question as to who is the greatest centre-forward in the history of the game. Though his trophy cabinet could be described as modest when compared with other illustrious footballers of his generation, the wealth of memories he forged for millions of football fans across the world probably makes him the richer for it. To this day, he remains Argentina’s top goal scorer in international competitions (and is surpassed overall only by the inhuman Lionel Messi); the only man to score hat-tricks at two separate World Cups. The man who has scored more Copa América goals than anybody else in history. In 333 official games for Fiorentina, he scored 207 times. His record of scoring in eleven consecutive Serie A games still remains unbeaten. In eleven seasons in Italy’s top flight, he scored more than 20 league goals on five separate occasions. If ever there was a man born to score goals, it is Gabriel Batistuta. Argentina’s Ángel Gabriel. The King of Florence. Batigol. The greatest striker of all time.